Please visit us at the Providence Fine Furnishings Show on October 23, 24 and 25. The show is a the Rhode Island Convention Center in Providence. Hours are 10-6 Friday and Saturday; 10-5 Sunday. L'Attitude Gallery recently commissioned a large (25 sq. 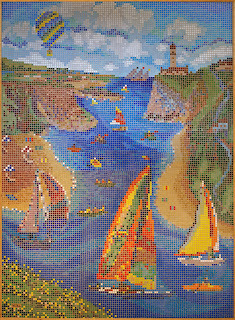 ft) custom wall mosaic for a wall near one of the entrances at Children's Hospital Boston. The piece, "Coastal Sails" was art directed by Betty Bothereau. The artist was Sara Morton and Artaic Innovative Mosaic used their robotic system to transform it into a mosaic of 3/8" vitreous glass tiles. We work with a number of artists who can create designs - in a variety of styles - that are well suited for glass tile mosaic murals. Please contact us if you are interested in a commission.